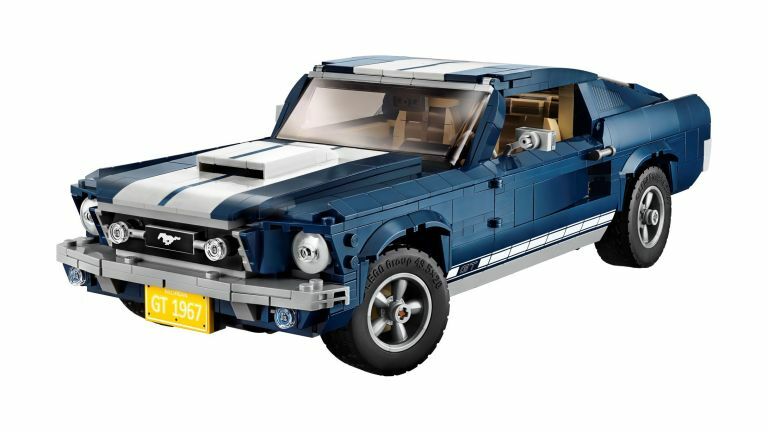 Lego's latest set brings a touch of muscle to your shelves – it's a Ford Mustang 1967 Fastback, perhaps best known as the car from Steve McQueen's Bullitt. Lego's version comes in classic blue instead of the movie's green, and has a bunch of extra options, too. You can build a standard road-ready version that looks incredible on its own, complete with racing stripes, Mustang badge, five-spoke rims and working steering. But you can also add a supercharger in place of the bonnet scoop, a ducktail spoiler, bigger exhausts, front chin spoiler, and even a nitrous tank – all as individual options, so you get to mix and match. At 1,470 pieces, it'll be a good project build that lasts a while, and having been developed in conjunction with Ford, it looks seriously good, no matter whether you want to angle it to show off the iconic front grille or equally famous rear lights. You can even lift the rear axle for an extra aggressive look, and the inside has seats, radio and gearstick that all mimic the original. It's out on March 1st for £119.99, but you can take a look over at the Lego Store now.